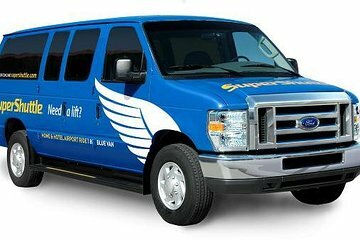 Booked a post cruise shuttle with Super Shuttle thru Viator. Went to the shuttle lot no Super Shuttle, the rep called couldn't find our reservation. They finally found it and told us it was on the way, no show, called again and they said 20 minutes, no show. I had to get another shuttle to the airport so we didn't miss our flight. Don't know who to blame. The van was clear and the diver very helpful. They can a little early which was good for me, not being late. Will use on future trips. Contact with suppershutter agent at port didn't find my name on reservation list, waiting for 2 hours finally shutter is coming. When I called in with my reservation number to inquire when the shuttle would arrive, I was informed that they could not find my reservation and that I should have made it a couple days earlier. I had made the reservation weeks earlier and had been on a cruise so the woman I was speaking to was incredibly rude and did not want to help, it took a lot of convincing to have her transfer me to someone else, who was polite and helpful and found my reservation immediately. Thank God, for that gentleman, he texted me confirmation of the shuttle and it arrived quickly. Had it not been for the attitude and rudeness of that operator this rating would have been higher. The driver was very nice as well. We came in at terminal 3. The porter took us to terminal 2 where most of the shuttles are. When we finally found a shuttle driver at terminal 2, he said they picked up at terminal 3 also. We could have used better information so we didn't drag ourselves all over just to wait. But the driver was very nice and helpful and the ride to the airport was good. Just needed some better instructions. We made our reservations for the shuttle before we left on our trip. We prepaid for a transfer to the airport from Terminal 2 at the Tampa cruise port for 9:30 am. We checked-in with the Super Shuttle representative as soon as we left the terminal. A shuttle left shortly after we checked in. There wasn't another one until an hour later. When this shuttle came, he let others fill it up and we had to protest because we had checked-in an hour earlier and these other people has just walked out of the terminal and lined up when they saw a shuttle. It very confusing so I won't book through Viator again. We were afraid that we wouldn't get to the airport in a timely manner. This was a transfer from Tampa cruise port terminal to airport. Once we figured out it was the super shuttle supposed to get us it was fine. Although the driver had no clue who we were and had to telephone in to see if we were on his list to pick up. Apparently we were not. Didn't make us feel too confident. But after waiting for 10-15 minutes on another couple we were off to the airport. So not the worst experience but not the best either. Helpful, courteous driver. Pick up right across the street from the cruise terminal. Very pleased.